The day starts out with a 2-hour delay due to some venue issues. Amos walks back to Pembroke from Homerton. Perry takes a nap. JR tries to take a nap, but ended up playing Smash anyway. The step-up to Nationals was immediately evident. There were going to be no easy games. 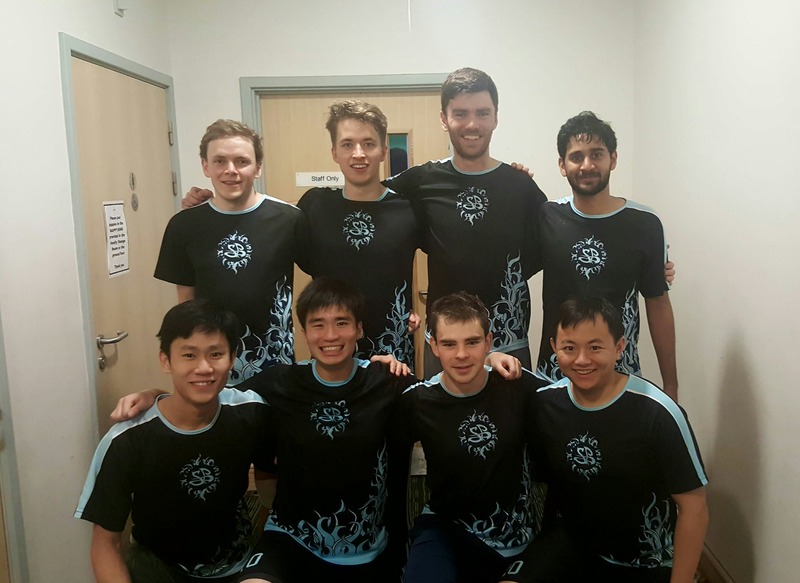 Our first match was against Lancaster, featuring Cambridge alumnus Clackers. Strange Blue started the day fairly slow – Lancaster was largely in the lead the entire game. At 5-5 with under 30 seconds to go, a throwaway from Lancaster gave SB last possession. JR toes the goal line to score against a wall for the win. Aberdeen came out with the standard indoors iso play, utilising their break-side scoobers and blades to convert quick points. With our tall defenders Niall and Will taking their iso, we were able to slow down their play and kept the score even. Will had some big break-side up-the-line passes. SB would hold last possession once again, but were unable to convert this time. We came out big one this one. Our defence was absolutely fired up. Sheffield’s side stack found little success, and Tejas reeled in the assists with lefty hammers. JR shuts down their playmaker Max, even getting a layout block. We went 6-0 up and continued to hold our lead for the rest of the game. SB carries a win against Lancaster into the top 8 power pools. Leeds were an extremely fast paced team. They ran a mixture of side stack and iso, featuring a huge receiver who gloriously (not so glorious for us, or Niall) came down with many high discs. We carried our defensive intensity from the previous game forward, but they were overall definitely the better drilled side. Heriot Watt had an extremely tall lineup. They utilised their iso to a fairly good extent, but some improved team defence in the endzone from SB prevented easy scores. Perry sprains both ankles (I should deserve an award) midway through the game. Despite trailing for most of the game, SB came back strong to even the score with a clutch pop pass from Tejas to Will after the buzzer. There was a 4-way tie (?!) in the power pool, and we unfortunately came out bottom (7th). This meant we had to play a crossover to stay in the top 8. Bournemouth’s defence was fairly poachy, which allowed our handlers freely reset and hold the disc. Patient offence, along with some hard man defence, gave SB the momentum to take the game. Durham 1 were the eventual winners of Division 2. SB put up a good fight, holding off many of their pull plays. However, we somehow decided to play the game on extra-hard mode, and gave Durham a 3-point-lead at the start of the game. At the buzzer, we were 6-7 down and with possession. A mistimed swing led to Durham quickly scoring to take the game, ending SB’s run for Division 2 champions. Sheffield completely adjusted their entire game plan. On offence, they scrapped their side stack and ran a more conventional vertical stack, which saw much greater success. Our defence was still doing well though. We were let down by our offence, with Sheffield’s force change from backhand to forehand affecting us a little too much (thanks to Perry’s advice in the spirit circle from our previous encounter - rookie mistake indeed). Another rematch. Coming in as the underdogs, we had nothing to lose, and gave it our all for the final game. The game starts off sloppily, with stall-7 hail-mary throws from both sides. Perry gets a huge layout block in the endzone against a Leeds defender. We continue to trade points, and the game eventually comes to universe with us in possession. Some miscommunication in the handler line caused us to turnover, and Leeds decisively went on to score off a fast-break. A strong finish to the weekend, leaving us at 8th position.